Kudzu is a green, blossoming vine native to Japan and China. In 1876, farmers brought kudzu to America to feed livestock and prevent soil erosion. Kudzu took root so well in the Southeastern U.S. that the U.S. Department of Agriculture now considers it a weed. Though kudzu's widespread growth irks farmers and gardeners, Southern cooks enjoy preparing kudzu recipes. Eat kudzu raw, sauteed, deep-fried, baked and jellied. Harvest kudzu in the Southeastern part of the United States. Kudzu grows between Florida and New Jersey from the East Coast to South Texas. Wear boots and protective clothing foraging for kudzu. Bring a clear picture of kudzu with you for identification purposes. 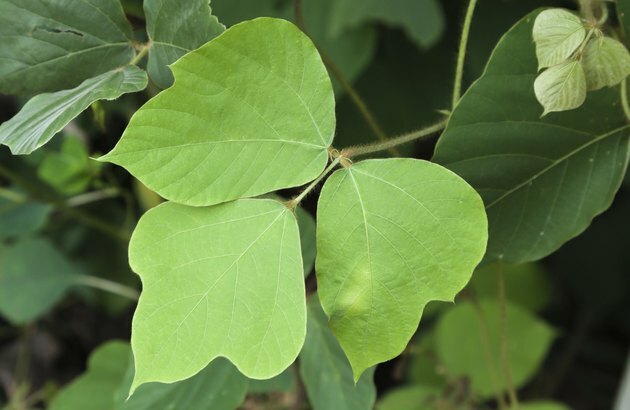 Kudzu and poison ivy look similar, so be careful to harvest the right plant. Do not harvest kudzu that has been sprayed with pesticides or chemicals. Separate edible parts of the kudzu plant from its inedible vine. Kudzu leaves, vine tips and roots are edible. The kudzu plant also produces fragrant, purple blossoms which you can make into jelly, syrup and candy. Wash kudzu parts thoroughly before cooking or eating them. Eat chopped kudzu leaves raw in salad or cook them like spinach leaves. Saute kudzu leaves, bake them into quiches or deep-fry them. Cook kudzu roots like potatoes, or dry them and grind them into powder. Use kudzu root powder as a breading for fried foods or a thickener for sauces. Fry or steam kudzu shoots like snow peas. Incorporate kudzu blossoms into jelly, candy and wine. Make kudzu tea with kudzu leaves, mint and honey. Kudzu roots contain protein, iron, fiber and other nutrients. Use caution when searching for kudzu. Avoid deep ditches, bug bites and poison ivy. If you are unsure of the identity or cleanliness of the kudzu you harvest, do not eat it.